Nephrotic syndrome, or nephrosis, is defined by the presence of nephrotic-range proteinuria, edema, hyperlipidemia, and hypoalbuminemia. While nephrotic-range proteinuria in adults is characterized by protein excretion of 3.5 g or more per day, in children it is defined as protein excretion of more than 40 mg/m2/h or a first-morning urine protein/creatinine of 2-3 mg/mg creatinine or greater. One of the most exciting developments in recent years in understanding the pathophysiology of nephrotic syndrome has occurred in the area of podocyte biology (see the image below). Schematic drawing of the glomerular barrier. Podo = podocytes; GBM = glomerular basement membrane; Endo = fenestrated endothelial cells; ESL = endothelial cell surface layer (often referred to as the glycocalyx). 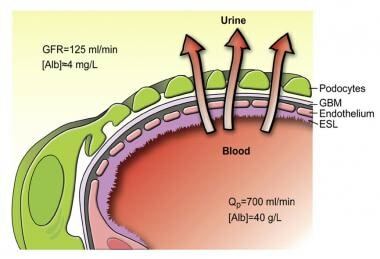 Primary urine is formed through the filtration of plasma fluid across the glomerular barrier (arrows); in humans, the glomerular filtration rate (GFR) is 125 mL/min. The plasma flow rate (Qp) is close to 700 mL/min, with the filtration fraction being 20%. The concentration of albumin in serum is 40 g/L, while the estimated concentration of albumin in primary urine is 4 mg/L, or 0.1% of its concentration in plasma. Courtesy of the American Physiological Society (www.the-aps.org) and reproduced from Haraldsson B, Nystrom J, Deen WM. Properties of the glomerular barrier and mechanisms of proteinuria. Physiol Rev. 2008 Apr;88(2):451-87. Pitting edema is the presenting symptom in about 95% of children with nephrotic syndrome. It is typically found in the lower extremities, face and periorbital regions, scrotum or labia, and abdomen (ascites). If kidney biopsy is not initially indicated, a trial of corticosteroids is the first step in the treatment of INS. Loop diuretics, such as furosemide (starting at 1-2 mg/kg/d), may improve edema. Metolazone may be beneficial in combination with furosemide for resistant edema. Angiotensin-converting enzyme (ACE) inhibitors and angiotensin II receptor blockers (ARBs) can reduce hypertension and may also contribute to reducing proteinuria. However, ACE inhibitors and ARBs can cause birth defects, so adolescent women who are taking these agents must be counseled regarding use of birth control, and pregnancy testing should be considered before starting these agents. Calcium channel blockers and beta blockers may also be used as first-line agents for hypertension. Alkylating agents (eg, cyclophosphamide [CYP], chlorambucil, nitrogen mustard) offer the benefit of possible sustained remission after a defined course of treatment, although with the possible risk of infertility and other side effects. Calcineurin inhibitors (eg, cyclosporin A [CSA], tacrolimus [TAC]) are steroid-sparing agents that can also be used in children who fail to respond to, or who subsequently relapse after, treatment with CYP, or in children whose families object to the use of CYP. Home monitoring of urine protein and fluid status is an important aspect of management. All patients and parents should be trained to monitor first morning urine proteins at home with urine dipstick. Urine testing at home is also useful in monitoring response (or nonresponse) to steroid treatment. Pediatric nephrotic syndrome, also known as nephrosis, is defined by the presence of nephrotic-range proteinuria, edema, hyperlipidemia, and hypoalbuminemia. Nephrotic-range proteinuria in adults is characterized by protein excretion of 3.5 g or more per day. However, because of the great range of body sizes in children, the pediatric definition of nephrotic-range proteinuria is more cumbersome. The use of a first-morning urine sample eliminates the contribution of potentially nonpathological orthostatic proteinuria, which might otherwise falsely elevate the protein level in a urine sample collected while a patient is active during the day. A urine protein/creatinine value of more than 2-3 mg/mg indicates nephrotic range proteinuria and correlates with results from 24-hour urine collection. Nephrotic syndrome is a constellation of clinical findings that is the result of massive renal losses of protein. Thus, nephrotic syndrome is not a disease itself, but the manifestation of many different glomerular diseases. These diseases might be acute and transient, such as postinfectious glomerulonephritis, or chronic and progressive, such as focal segmental glomerulosclerosis (FSGS). Still other diseases might be relapsing and remitting, such as minimal change nephrotic syndrome (MCNS). The glomerular diseases that cause nephrotic syndrome generally can be divided into primary and secondary etiologies. Primary nephrotic syndrome (PNS), also known as idiopathic nephrotic syndrome (INS), is associated with glomerular diseases intrinsic to the kidney and not related to systemic causes. The subcategories of INS are based on histological descriptions, but clinical-pathological correlations have been made. A wide variety of glomerular lesions can be seen in INS. These include MCNS, focal segmental glomerulosclerosis (FSGS), membranous nephropathy (MN), membranoproliferative glomerulonephritis (MPGN), C3 glomerulonephritis (C3GN), IgA nephropathy, diffuse mesangial proliferation, and others. By definition, secondary nephrotic syndrome refers to an etiology extrinsic to the kidney. Secondary causes of nephrotic syndrome include (1) autoimmune and vasculitic diseases, such as Henoch-Schönlein purpura (HSP), systemic lupus erythematosus, and antineutrophil cytoplasmic antibody (ANCA)–associated vasculitis; (2) infectious diseases, such as congenital syphilis, malaria, human immunodeficiency virus (HIV), and hepatitis B and C; (3) malignancy; (4) environmental and drug exposure, such as heroin and mercury; and (5) systemic diseases such as diabetes mellitus, among many other causes (see Etiology). Nephrotic syndrome may also be caused by genetic abnormalities. Infantile NS (presenting before age 3 mo) and congenital NS (presenting at age 4-12 mo) have been associated with defects in the nephrin gene (NPHS1), phospholipase C epsilon 1 gene (PLCE1), and the Wilms tumor suppressor gene (WT1). Mutations in the podocin gene (NPHS2) are associated with a familial, autosomal-recessive form of FSGS. Mutations in the α-actinin-4 gene (ACTN4) and the gene TRPC6 are associated with autosomal-dominant forms of familial FSGS. INS is divided into steroid-sensitive (SSNS) and steroid-resistant nephrotic syndrome (SRNS) because response to steroids has a high correlation with histological subtype and prognosis. The landmark study of nephrotic syndrome in children, the International Study of Kidney Disease in Children (ISKDC), found that the vast majority of preadolescent children with INS had MCNS on kidney biopsy. [3, 4] Whereas 90% of children with MCNS responded to corticosteroid treatment with remission of their nephrotic syndrome, only 20% of children with FSGS responded to steroids. This article focuses on INS, primarily SSNS (which primarily consists of MCNS). The treatment and prognosis of SRNS (primarily FSGS in children) is briefly discussed. (see Treatment). The discussion of congenital and secondary nephrotic syndrome is beyond the scope of this article. The hallmark of INS is massive proteinuria, leading to decreased circulating albumin levels. The initiating event that produces proteinuria remains unknown. However, strong evidence suggests that INS, at least in part, has an immune pathogenesis. The effect of glucocorticoids on inducing remission in INS implicates the immune system, and particularly T-lymphocytes, in the pathogenesis of the condition. Glucocorticoids, primarily acting through the nuclear factor kappaB (NF-κB) transcription pathway, have a variety of effects, including inhibiting cytokine production and inhibiting T-cell production and proliferation. A variety of studies provide further evidence of the role of T-cells in INS. Patients with INS in remission have alterations in the NF-κB pathway compared with healthy control subjects. NF-κB transcription is up-regulated in relapse of INS compared with remission. Additionally, nephrotic syndrome has been reported in patients with Hodgkin lymphoma, a T-cell disease. Other observations in INS include altered thymic regulation of T-cell differentiation and alterations in T-cell subsets in INS patients compared with healthy controls. In addition to T-cells, the recent reports of remission in INS after treatment with rituximab, an anti-CD20 monoclonal antibody that results in complete depletion of B lymphocytes, implicate a role for B cells in the pathogenesis of INS. Perhaps the most exciting development in recent years in understanding the pathophysiology of nephrotic syndrome has occurred in the area of podocyte biology (see the image below). The glomerular filtration barrier consists of the fenestrated capillary endothelium, the extracellular basement membrane, and the intercalated podocyte foot processes, connected by 35-45 nm slit diaphragms. Nephrotic syndrome is associated with the biopsy finding of fusion (effacement) of podocyte foot processes. This effacement of the podocytes long was thought to be a secondary phenomenon of nephrotic syndrome. Nephrin is a transmembrane protein that is a major structural element of the slit diaphragm and is encoded by the NPHS1 gene on chromosome 19. Mutations in the NPHS1 gene are responsible for autosomal recessive, congenital nephrotic syndrome of the Finnish type (FNS). Other genetic forms of nephrotic syndrome continue to shed light on the pathogenesis of INS. Mutations in the developmental regulatory gene WT1 are associated with forms of congenital nephrotic syndrome associated with male pseudohermaphroditism, Wilms tumor (Denys-Drash syndrome), and gonadoblastoma (Frasier syndrome). The role of alterations in the slit diaphragm in MCNS has not been elucidated. Podocin appears to be expressed normally in MCNS but decreased in FSGS. Mutations in nephrin and podocin do not at this time appear to play a role in steroid-sensitive nephrotic syndrome. However, acquired alterations in slit diaphragm architecture might play a role in INS apart from actual mutations in the genes encoding podocyte proteins. Various authors have reported changes in expression and distribution of nephrin in MCNS. Coward et al demonstrated that nephrotic plasma induces translocation of the slit diaphragm proteins nephrin, podocin, and CD2AP away from the plasma membrane into the cytoplasm of the podocyte. These authors also demonstrated the normal plasma might contain factors that maintain the integrity of slit diaphragm architecture and that the lack of certain factors (rather than the presence of an abnormal circulating factor) might be responsible for alterations in the podocyte architecture and development of INS. Apart from the podocyte and slit diaphragm, alterations in the glomerular basement membrane also likely play a role in the proteinuria of nephrotic syndrome. In INS, the glomerular capillary permeability to albumin is selectively increased, and this increase in filtered load overcomes the modest ability of the tubules to reabsorb protein. The classical explanation for edema formation is a decrease in plasma oncotic pressure, as a consequence of low serum albumin levels, causing an extravasation of plasma water into the interstitial space. The resulting contraction in plasma volume (PV) leads to stimulation of the renin-angiotensin-aldosterone axis and antidiuretic hormone. The resultant retention of sodium and water by the renal tubules contributes to the extension and maintenance of edema. While the classical model of edema (also known as the "underfill hypothesis") seems logical, certain clinical and experimental observations do not completely support this traditional concept. First, the PV has not always been found to be decreased and, in fact, in most adults, measurements of PV have shown it to be increased. Only in young children with MCNS have most (but not all) studies demonstrated a reduced PV. Additionally, most studies have failed to document elevated levels of renin, angiotensin, or aldosterone, even during times of avid sodium retention. Active sodium reabsorption also continues despite actions that should suppress renin effects (eg, as albumin infusion or angiotensin-converting enzyme [ACE] inhibitor administration). Another model of edema formation, the "overfill hypothesis," postulates a primary defect in renal sodium handling. A primary increase in renal sodium reabsorption leads to net salt and water retention and subsequent hypertension. ANP might play a role is this mechanism; studies have shown an impaired response to ANP in nephrotic syndrome. This ANP resistance, in part, might be caused by overactive efferent sympathetic nervous activity, as well as enhanced tubular breakdown of cyclic guanosine monophosphate. INS is accompanied by disordered lipid metabolism. Apolipoprotein (apo)-B–containing lipoproteins are elevated, including very-low-density lipoprotein (VLDL), intermediate-density lipoprotein (IDL), low-density lipoproteins (LDL), and lipoprotein(a), with resultant increases in total cholesterol and LDL-cholesterol. The level of high-density lipoprotein (HDL) cholesterol is normal or low. Elevations in triglyceride levels occur with severe hypoalbuminemia. The traditional explanation for hyperlipidemia in INS was the increased synthesis of lipoproteins that accompany increased hepatic albumin synthesis due to hypoalbuminemia. However, serum cholesterol levels have been shown to be independent of albumin synthesis rates. Renal vein thrombosis, deep vein thrombosis, and pulmonary embolism (PE) are the most frequently encountered TEC in children. Other venous sites of thrombosis include the superior sagittal sinus, other cerebral venous sites, and the inferior vena cava. Nephrotic syndrome is a hypercoagulable state. The increased risk of thrombosis can be attributed to 2 basic mechanisms: (1) urine losses of antithrombotic proteins and (2) increased synthesis of prothrombotic factors. Abnormalities described in INS include decreased antithrombotic factors and increased synthesis of pro-thrombotic factors. Various infections can also occur, including meningitis, cellulitis, viral infections, and others. Varicella is a particular concern in immunosuppressed patients and can be lethal. Prompt recognition and treatment with acyclovir (or postexposure prophylaxis with varicella-zoster immune globulin [VZIG]) is essential. Routine childhood varicella immunization has alleviated some of the concern regarding this complication. Infection, viral or bacterial, can trigger relapse of INS and further complicate the course of the condition. Risk of infection may be increased in INS because of low immunoglobulin (Ig)G levels, which do not appear to be the result of urinary losses. Instead, low IgG levels seem to be the result of impaired synthesis, again pointing to a primary disorder in lymphocyte regulation in INS. Use of ACE inhibitors or angiotensin II receptor blockers (ARBs) in conjunction with volume depletion can also precipitate AKF. Black and Hispanic children appear to have an increased risk of steroid-resistant nephrotic syndrome and FSGS. [33, 34] An increased incidence of INS is reported in Asian children, (6 times the rate seen in European children). An increased incidence of INS is also seen in Indian, Japanese, and Southwest Asian children. In children younger than 8 years at onset, the ratio of males to females varies from 2:1 to 3:2 in various studies. In older children, adolescents, and adults, the male-to-female prevalence is approximately equal. ISKDC data indicate that 66% of patients with either MCNS or FSGS are male, whereas 65% of individuals with MPGN are female. Additionally, INS is associated with an increased risk of multiple complications, including edema, infection, thrombosis, hyperlipidemia, acute kidney failure, and possible increased risk of cardiovascular disease. The prognosis varies, depending on whether the nephrotic syndrome is steroid responsive or steroid resistant. Patients who remain responsive to steroids with remission of proteinuria, even with frequent relapses, generally have a good prognosis. The ISKDC found that in 93% of children with INS who responded to steroids, kidney biopsy revealed MCNS. In contrast, 75% of patients who did not initially respond to steroids had histology other than MCNS. About 90% of children with MCNS (but only 20% of children with focal segmental glomerulosclerosis [FSGS]) achieve remission after the initial course of steroid treatment. Despite the generally favorable prognosis in patients who respond to steroids, the ISKDC reported a 60% rate of subsequent relapses, which can lead to complications, increased morbidity, and decreased quality of life. A longer course of initial steroid treatment (12 wk rather than the original ISKDC protocol of 8 wk) may reduce the rate of subsequent relapse to 36%,  which still represents a large number of patients who undergo repeated courses of immunosuppression, with possible hospitalizations, edema, infections, medication side effects, and other comorbidities. A long-term study of 398 children with INS found that the percentage of children who became free of relapses during the course of their disease rose from 44% one year after diagnosis to 69% at 5 years and 84% 10 years after diagnosis. [28, 36] Although most children with INS who respond to steroids achieve long-term remission, relapses may continue into adulthood. Older studies suggested that more than 90% of children achieve long-term remission without further relapses by puberty. However, this has recently been challenged by surveys indicating a rate of relapse during adulthood as high as 27-42%. In a retrospective study, Vivarelli et al reported that the length of time between initiation of steroid treatment and syndrome remission is an early prognostic indicator for children with INS. In study patients who did not suffer relapse or who relapsed infrequently, the median time from treatment onset to remission was less than 7 days. In patients who had frequent relapses or who developed steroid-dependent nephrotic syndrome, the median time to remission was more than 7 days. Most patients who do not achieve remission of proteinuria with steroids have kidney biopsy findings other than MCNS. The most common diagnosis in these patients is FSGS. Soon after nephrotic syndrome is diagnosed, the patient and family should be educated about the disease, its management, and its expected course. The family should participate in therapeutic decisions and should be encouraged to adhere to the medical regimen. Consultation with social workers and mental health care workers may be useful. Links to resources for parents can be found at the Web sites for the American Society of Pediatric Nephrology (ASPN) and the National Kidney Foundation. Niaudet P. Steroid-Sensitive Idiopathic Nephrotic Syndrome in Children. Avner E, Harmon W and Niaudet P. Pediatric Nephrology. 5th ed. Philadelphia: Lippincott, Williams & Wilkins; 2004. chap 27. Hogg RJ, Portman RJ, Milliner D, Lemley KV, Eddy A, Ingelfinger J. Evaluation and management of proteinuria and nephrotic syndrome in children: recommendations from a pediatric nephrology panel established at the National Kidney Foundation conference on proteinuria, albuminuria, risk, assessment, detection, and elimination (PARADE). Pediatrics. 2000 Jun. 105(6):1242-9. [Medline]. [Guideline] International Study of Kidney Disease in Children (ISKDC). Nephrotic syndrome in children: prediction of histopathology from clinical and laboratory characteristics at time of diagnosis. A report of the International Study of Kidney Disease in Children. Kidney Int. 1978 Feb. 13(2):159-65. [Medline]. [Guideline] International Study of Kidney Disease in Children (ISKDC). The primary nephrotic syndrome in children. Identification of patients with minimal change nephrotic syndrome from initial response to prednisone. A report of the International Study of Kidney Disease in Children. J Pediatr. 1981 Apr. 98(4):561-4. [Medline]. Elie V, Fakhoury M, Deschênes G, Jacqz-Aigrain E. Physiopathology of idiopathic nephrotic syndrome: lessons from glucocorticoids and epigenetic perspectives. Pediatr Nephrol. 2012 Aug. 27(8):1249-56. [Medline]. van den Berg JG, Weening JJ. Role of the immune system in the pathogenesis of idiopathic nephrotic syndrome. Clin Sci (Lond). 2004 Aug. 107(2):125-36. [Medline]. Coleman JE, Watson AR. Hyperlipidaemia, diet and simvastatin therapy in steroid-resistant nephrotic syndrome of childhood. Pediatr Nephrol. 1996 Apr. 10(2):171-4. [Medline]. Niaudet P. Genetic forms of nephrotic syndrome. Pediatr Nephrol. 2004 Dec. 19(12):1313-8. [Medline]. Caridi G, Trivelli A, Sanna-Cherchi S, Perfumo F, Ghiggeri GM. Familial forms of nephrotic syndrome. Pediatr Nephrol. 2010 Feb. 25(2):241-52. [Medline]. Benoit G, Machuca E, Antignac C. Hereditary nephrotic syndrome: a systematic approach for genetic testing and a review of associated podocyte gene mutations. Pediatr Nephrol. 2010 Sep. 25(9):1621-32. [Medline]. Philippe A, Nevo F, Esquivel EL, Reklaityte D, Gribouval O, Tete MJ. Nephrin mutations can cause childhood-onset steroid-resistant nephrotic syndrome. J Am Soc Nephrol. 2008 Oct. 19(10):1871-8. [Medline]. Santin S, Garcia-Maset R, Ruiz P, Gimenez I, Zamora I, Pena A. Nephrin mutations cause childhood- and adult-onset focal segmental glomerulosclerosis. Kidney Int. 2009 Dec. 76(12):1268-76. [Medline]. Kronenberg F. APOL1 variants and kidney disease. There is no such thing as a free lunch. Nephrol Dial Transplant. 2011 Mar. 26(3):775-8. [Medline]. Mele C, Iatropoulos P, Donadelli R, Calabria A, Maranta R, Cassis P. MYO1E mutations and childhood familial focal segmental glomerulosclerosis. N Engl J Med. 2011 Jul 28. 365(4):295-306. [Medline]. Coward RJ, Foster RR, Patton D, Ni L, Lennon R, Bates DO. Nephrotic plasma alters slit diaphragm-dependent signaling and translocates nephrin, Podocin, and CD2 associated protein in cultured human podocytes. J Am Soc Nephrol. 2005 Mar. 16(3):629-37. [Medline]. Anderson S, Komers R, Brenner BM. Renal and Systemic Manifestations of Glomerular Disease. Brenner BM. Brenner and Rector's The Kidney. 8th ed. Philadelphia: Saunders Elsvier; 2008. Chapter 26. Saland JM, Ginsberg H, Fisher EA. Dyslipidemia in pediatric renal disease: epidemiology, pathophysiology, and management. Curr Opin Pediatr. 2002 Apr. 14(2):197-204. [Medline]. Kerlin BA, Ayoob R, Smoyer WE. Epidemiology and pathophysiology of nephrotic syndrome-associated thromboembolic disease. Clin J Am Soc Nephrol. 2012 Mar. 7(3):513-20. [Medline]. Zaffanello M, Franchini M. Thromboembolism in childhood nephrotic syndrome: a rare but serious complication. Hematology. 2007 Feb. 12(1):69-73. [Medline]. Citak A, Emre S, Sâirin A, Bilge I, Nayir A. Hemostatic problems and thromboembolic complications in nephrotic children. Pediatr Nephrol. 2000 Feb. 14(2):138-42. [Medline]. Loscalzo J. Venous thrombosis in the nephrotic syndrome. N Engl J Med. 2013 Mar 7. 368(10):956-8. [Medline]. Singhal R, Brimble KS. Thromboembolic complications in the nephrotic syndrome: pathophysiology and clinical management. Thromb Res. 2006. 118(3):397-407. [Medline]. Wu HM, Tang JL, Sha ZH, Cao L, Li YP. Interventions for preventing infection in nephrotic syndrome. Cochrane Database Syst Rev. 2004. CD003964. [Medline]. Agarwal N, Phadke KD, Garg I, Alexander P. Acute renal failure in children with idiopathic nephrotic syndrome. Pediatr Nephrol. 2003 Dec. 18(12):1289-92. [Medline]. Eddy AA, Symons JM. Nephrotic syndrome in childhood. Lancet. 2003 Aug 23. 362(9384):629-39. [Medline]. Churg J, Habib R, White RH. Pathology of the nephrotic syndrome in children: a report for the International Study of Kidney Disease in Children. Lancet. 1970 Jun 20. 760(1):1299-302. [Medline]. Wong W. Idiopathic nephrotic syndrome in New Zealand children, demographic, clinical features, initial management and outcome after twelve-month follow-up: results of a three-year national surveillance study. J Paediatr Child Health. 2007 May. 43(5):337-41. [Medline]. Borges FF, Shiraichi L, da Silva MP, Nishimoto EI, Nogueira PC. Is focal segmental glomerulosclerosis increasing in patients with nephrotic syndrome?. Pediatr Nephrol. 2007 Sep. 22(9):1309-13. [Medline]. Boyer O, Moulder JK, Somers MJ. Focal and segmental glomerulosclerosis in children: a longitudinal assessment. Pediatr Nephrol. 2007 Aug. 22(8):1159-66. [Medline]. Ingulli E, Tejani A. Racial differences in the incidence and renal outcome of idiopathic focal segmental glomerulosclerosis in children. Pediatr Nephrol. 1991 Jul. 5(4):393-7. [Medline]. Ehrich JH, Brodehl J. Long versus standard prednisone therapy for initial treatment of idiopathic nephrotic syndrome in children. Arbeitsgemeinschaft für Pädiatrische Nephrologie. Eur J Pediatr. 1993 Apr. 152(4):357-61. [Medline]. Tarshish P, Tobin JN, Bernstein J, Edelmann CM Jr. Prognostic significance of the early course of minimal change nephrotic syndrome: report of the International Study of Kidney Disease in Children. J Am Soc Nephrol. 1997 May. 8(5):769-76. [Medline]. Vivarelli M, Moscaritolo E, Tsalkidis A, Massella L, Emma F. Time for initial response to steroids is a major prognostic factor in idiopathic nephrotic syndrome. J Pediatr. 2010 Jun. 156(6):965-71. [Medline]. Ruth EM, Kemper MJ, Leumann EP, Laube GF, Neuhaus TJ. Children with steroid-sensitive nephrotic syndrome come of age: long-term outcome. J Pediatr. 2005 Aug. 147(2):202-7. [Medline]. Abeyagunawardena AS, Sebire NJ, Risdon RA, et al. Predictors of long-term outcome of children with idiopathic focal segmental glomerulosclerosis. Pediatr Nephrol. 2007 Feb. 22(2):215-21. [Medline]. Gipson DS, Chin H, Presler TP, et al. Differential risk of remission and ESRD in childhood FSGS. Pediatr Nephrol. 2006 Mar. 21(3):344-9. [Medline]. Paik KH, Lee BH, Cho HY, et al. Primary focal segmental glomerular sclerosis in children: clinical course and prognosis. Pediatr Nephrol. 2007 Mar. 22(3):389-95. [Medline]. Gipson DS, Massengill SF, Yao L, et al. Management of childhood onset nephrotic syndrome. Pediatrics. 2009 Aug. 124(2):747-57. [Medline]. Niaudet P. Steroid-Resistant Idiopathic Nephrotic Syndrome in Children. Avner E, Harmon W, and Niaudet P. Pediatric Nephrology. 5th ed. Philadelphia: Lippincott, Williams & Wilkins; 2004. Chapter 28. Strife CF, Braun MC and West CD. Membranoproliferative Glomerulonephritis. Avner E, Harmon W and Niaudet P. Pediatric Nephrology. 5th ed. Philadelphia: Lippincott, Williams & Wilkins; 2004. Chapter 32. Makker SP. Membranous Nephropathy. Avner E, Harmon W and Niaudet P. Pediatric Nephrology. 5th ed. Philadelphia: Lippincott, Williams & Wilkins; 2004. Chapter 33. Lombel RM, Gipson DS, Hodson EM. Treatment of steroid-sensitive nephrotic syndrome: new guidelines from KDIGO. Pediatr Nephrol. 2013 Mar. 28(3):415-26. [Medline]. Prescott WA Jr, Streetman DA, Streetman DS. The potential role of HMG-CoA reductase inhibitors in pediatric nephrotic syndrome. Ann Pharmacother. 2004 Dec. 38(12):2105-14. [Medline]. Sanjad SA, al-Abbad A, al-Shorafa S. Management of hyperlipidemia in children with refractory nephrotic syndrome: the effect of statin therapy. J Pediatr. 1997 Mar. 130(3):470-4. [Medline]. Rheault MN, Zhang L, Selewski DT, et al. AKI in Children Hospitalized with Nephrotic Syndrome. Clin J Am Soc Nephrol. 2015 Dec 7. 10 (12):2110-8. [Medline]. Ekka BK, Bagga A, Srivastava RN. Single- versus divided-dose prednisolone therapy for relapses of nephrotic syndrome. Pediatr Nephrol. 1997 Oct. 11(5):597-9. [Medline]. Hodson EM, Willis NS, Craig JC. Corticosteroid therapy for nephrotic syndrome in children. Cochrane Database Syst Rev. 2007. (4):CD001533. [Medline]. Hodson EM, Willis NS, Craig JC. Non-corticosteroid treatment for nephrotic syndrome in children. Cochrane Database Syst Rev. 2008 Jan 23. CD002290. [Medline]. Latta K, von Schnakenburg C, Ehrich JH. A meta-analysis of cytotoxic treatment for frequently relapsing nephrotic syndrome in children. Pediatr Nephrol. 2001 Mar. 16(3):271-82. [Medline]. Cyclophosphamide treatment of steroid dependent nephrotic syndrome: comparison of eight week with 12 week course. Report of Arbeitsgemeinschaft für Pädiatrische Nephrologie. Arch Dis Child. 1987 Nov. 62(11):1102-6. [Medline]. [Full Text]. Ueda N, Kuno K, Ito S. Eight and 12 week courses of cyclophosphamide in nephrotic syndrome. Arch Dis Child. 1990 Oct. 65(10):1147-50. [Medline]. [Full Text]. Choudhry S, Bagga A, Hari P, Sharma S, Kalaivani M, Dinda A. Efficacy and safety of tacrolimus versus cyclosporine in children with steroid-resistant nephrotic syndrome: a randomized controlled trial. Am J Kidney Dis. 2009 May. 53(5):760-9. [Medline]. Wang W, Xia Y, Mao J, Chen Y, Wang D, Shen H, et al. Treatment of tacrolimus or cyclosporine A in children with idiopathic nephrotic syndrome. Pediatr Nephrol. 2012 Nov. 27(11):2073-9. [Medline]. Takeuchi H, Matsuno N, Senuma K, et al. Evidence of different pharmacokinetics including relationship among AUC, peak, and trough levels between cyclosporine and tacrolimus in renal transplant recipients using new pharmacokinetic parameter--why cyclosporine is monitored by C(2) level and tacrolimus by trough level--. Biol Pharm Bull. 2008 Jan. 31(1):90-4. [Medline]. Sinha MD, MacLeod R, Rigby E, Clark AG. Treatment of severe steroid-dependent nephrotic syndrome (SDNS) in children with tacrolimus. Nephrol Dial Transplant. 2006 Jul. 21(7):1848-54. [Medline]. Hogg RJ, Fitzgibbons L, Bruick J, et al. Mycophenolate mofetil in children with frequently relapsing nephrotic syndrome: a report from the Southwest Pediatric Nephrology Study Group. Clin J Am Soc Nephrol. 2006 Nov. 1(6):1173-8. [Medline]. Basu B, Mahapatra TK, Mondal N. Mycophenolate Mofetil Following Rituximab in Children With Steroid-Resistant Nephrotic Syndrome. Pediatrics. 2015 Jul. 136 (1):e132-9. [Medline]. Greenbaum LA, Benndorf R, Smoyer WE. Childhood nephrotic syndrome--current and future therapies. Nat Rev Nephrol. 2012 Aug. 8(8):445-58. [Medline]. Kamei K, Ishikura K, Sako M, Aya K, Tanaka R, Nozu K, et al. Long-term outcome of childhood-onset complicated nephrotic syndrome after a multicenter, double-blind, randomized, placebo-controlled trial of rituximab. Pediatr Nephrol. 2017 Jun 29. [Medline]. Hodson EM, Habashy D, Craig JC. Interventions for idiopathic steroid-resistant nephrotic syndrome in children. Cochrane Database Syst Rev. 2006 Apr 19. CD003594. [Medline]. de Mello VR, Rodrigues MT, Mastrocinque TH, et al. Mycophenolate mofetil in children with steroid/cyclophosphamide-resistant nephrotic syndrome. Pediatr Nephrol. 2010 Mar. 25(3):453-60. [Medline]. Gipson DS, Trachtman H, Kaskel FJ, Greene TH, Radeva MK, Gassman JJ, et al. Clinical trial of focal segmental glomerulosclerosis in children and young adults. Kidney Int. 2011 Oct. 80(8):868-78. [Medline]. [Full Text]. Mendoza SA, Reznik VM, Griswold WR, Krensky AM, Yorgin PD, Tune BM. Treatment of steroid-resistant focal segmental glomerulosclerosis with pulse methylprednisolone and alkylating agents. Pediatr Nephrol. 1990 Jul. 4(4):303-7. [Medline]. Kamei K, Ito S, Nozu K, et al. Single dose of rituximab for refractory steroid-dependent nephrotic syndrome in children. Pediatr Nephrol. 2009 Jul. 24(7):1321-8. [Medline]. Guigonis V, Dallocchio A, Baudouin V, Dehennault M, Hachon-Le Camus C, Afanetti M. Rituximab treatment for severe steroid- or cyclosporine-dependent nephrotic syndrome: a multicentric series of 22 cases. Pediatr Nephrol. 2008 Aug. 23(8):1269-79. [Medline]. Ravani P, Magnasco A, Edefonti A, et al. Short-term effects of rituximab in children with steroid- and calcineurin-dependent nephrotic syndrome: a randomized controlled trial. Clin J Am Soc Nephrol. 2011 Jun. 6(6):1308-15. [Medline]. [Full Text]. Haffner D, Fischer DC. Nephrotic syndrome and rituximab: facts and perspectives. Pediatr Nephrol. 2009 Aug. 24(8):1433-8. [Medline]. Gulati A, Sinha A, Jordan SC, et al. Efficacy and safety of treatment with rituximab for difficult steroid-resistant and -dependent nephrotic syndrome: multicentric report. Clin J Am Soc Nephrol. 2010 Dec. 5(12):2207-12. [Medline]. [Full Text]. Chaumais MC, Garnier A, Chalard F, et al. Fatal pulmonary fibrosis after rituximab administration. Pediatr Nephrol. 2009 Sep. 24(9):1753-5. [Medline]. Kveder R. Therapy-resistant focal and segmental glomerulosclerosis. Nephrol Dial Transplant. 2003 Jul. 18 Suppl 5:v34-7. [Medline]. Ponticelli C. Recurrence of focal segmental glomerular sclerosis (FSGS) after renal transplantation. Nephrol Dial Transplant. 2010 Jan. 25(1):25-31. [Medline]. De Smet E, Rioux JP, Ammann H, Deziel C, Querin S. FSGS permeability factor-associated nephrotic syndrome: remission after oral galactose therapy. Nephrol Dial Transplant. 2009 Sep. 24(9):2938-40. [Medline]. Arun S, Bhatnagar S, Menon S, Saini S, Hari P, Bagga A. Efficacy of zinc supplements in reducing relapses in steroid-sensitive nephrotic syndrome. Pediatr Nephrol. 2009 Aug. 24(8):1583-6. [Medline]. Alpay H, Yildiz N, Onar A, Temizer H, Ozcay S. Varicella vaccination in children with steroid-sensitive nephrotic syndrome. Pediatr Nephrol. 2002 Mar. 17(3):181-3. [Medline]. Outlook Favorable in Relapsing Nephrotic Syndrome. Medscape. Oct 16 2014. [Full Text]. Ishikura K, Yoshikawa N, Nakazato H, et al. Morbidity in children with frequently relapsing nephrosis: 10-year follow-up of a randomized controlled trial. Pediatr Nephrol. 2014 Oct 3. [Medline]. Mishra OP, Abhinay A, Mishra RN, Prasad R, Pohl M. Can We Predict Relapses in Children with Idiopathic Steroid-Sensitive Nephrotic Syndrome?. J Trop Pediatr. 2013 Apr 24. [Medline]. Roberti I, Vyas S. Long-term outcome of children with steroid-resistant nephrotic syndrome treated with tacrolimus. Pediatr Nephrol. 2010 Jun. 25(6):1117-24. [Medline]. Basu B, Sander A, Roy B, Preussler S, Barua S, Mahapatra TKS, et al. Efficacy of Rituximab vs Tacrolimus in Pediatric Corticosteroid-Dependent Nephrotic Syndrome: A Randomized Clinical Trial. JAMA Pediatr. 2018 Aug 1. 172 (8):757-764. [Medline]. Jellouli M, Charfi R, Maalej B, Mahfoud A, Trabelsi S, Gargah T. Rituximab in The Management of Pediatric Steroid-Resistant Nephrotic Syndrome: A Systematic Review. J Pediatr. 2018 Jun. 197:191-197.e1. [Medline].